There is deep substance in the imagery of these cards: the symbolism of J.R.R. Tolkien's Middle-Earth profoundly integrated with the Kabbala Tree of Life. Familiarity with the story of the Lord of the Rings is recommended so that one can translate the scene on the card to its corresponding tarot meaning. 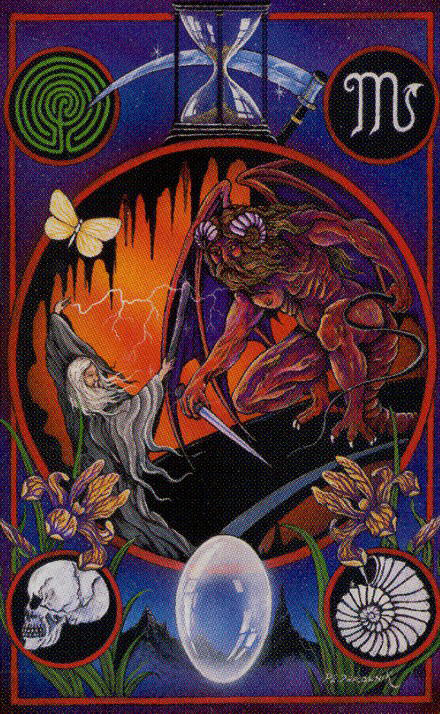 The Death card is represented by Gandalf's epic battle with the Balrog in the mines of Moria. In that battle, Gandalf is killed but is subsequently reincarnated as the White Wizard, more powerful than his former self. This imagery is indicative of the transformation brought by Death, a central theme to the tarot.